Won Best Documentary Feature (Daniel Lindsay, T.J. Martin, Rich Middlemas). Even if documentaries aren’t your thing, if you like sports films or if you always find yourself rooting for the little guy, Undefeated is the film for you. A high school football team in the heart of Memphis, the Manassas Tigers have never won a playoff game. In 2009, their coach, Bill Courtney, after 6 years volunteering with the program is determined to have his guys win a playoff game. The documentary focuses on four main characters. Courtney is a family man who owns a business but has a passion for football and coaching. He sees a need, being a man who grew up without a father, to step up and teach the teenagers of Manassas how to overcome their circumstances. His three star players have chances for scholarships and college (or maybe even college football). Courtney and another coach go so far as to help O.C. Brown by giving him a place to stay during the week so that he can have a tutor. There are a lot of anger issues among the teens, and one star player has a lot of his season taken from him in a surprise injury. Most of them live in poverty and with only one parent. Courtney teaches again and again that you play with character–if you play for the team instead of yourself–winning will follow. He teaches leadership and humility, although not necessarily patience. I thought the film was very well done. The pacing was good, the cinematography had a raw darkness to it that gave it a great mood, and the narrative was great. It isn’t necessarily an uplifting story, but it held my attention all the same. The selflessness of the couches is touching and the team meetings are very revealing. I hope that what Courtney could do for the Manassas Tigers spread through the rest of the school and continued once he left. 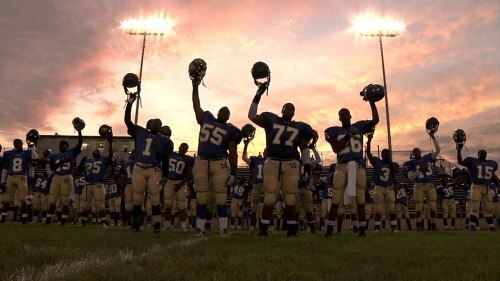 If you enjoy a good sport film or documentary, I would definitely recommend Undefeated. Nominated for Best Foreign Language Film (Joseph Cedar). 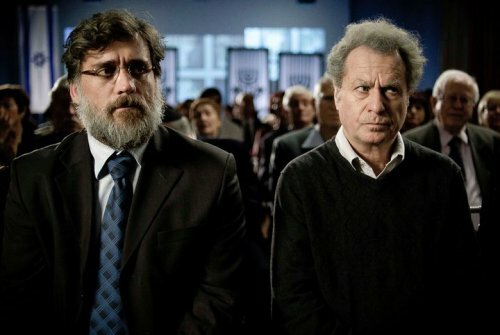 Footnote is an interesting Israeli film full of comedy and family drama. The story of the film is fairly boring, but perhaps that is what makes it so good. Despite the fact that it is a foreign film, the story is so every-man and ordinary that the circumstances, both comical and heart wrenching are relatable for even yours truly. It was not my favourite film, but it borrowed techniques of humor and story telling from some of my most beloved styles that I appreciated it for what it was. The wonderful camera work communicates the extensive family drama. There is even an arch nemesis. It is the story of a father and his son, Eliezar and Uriel Shkolnik who are both scholars in the same field. Uriel has been significantly more successful than his father, whose life’s work was stolen from him and published directly before Eliezar was set to release his Talmudic Studies work. As such, his only published acknowledgement is in the footnote of another noteworthy scholar’s book. Eliezar has studied the same thing his entire life, and although he has been nominated every year to receive the Israel Prize, he never receives it. In turn, he is very critical of his son’s work, which is much more philosophical and less grounded in fact, as he believes. Despite this, Uriel has been exceedingly successful in his career. The rest of the plot I will leave for you to discover. The characters are very interesting. Uriel always feels as if he has to overcome his father’s poor reputation in the scholarly community, while Eliezar believes that he himself is one of the most knowledgeable scholars. He will publicly criticize his own son, despite his own failings. The marriages and father-son relationships are strained and cyclical. Yes, I did say that there is a comedic element to this film. It is constantly teetering between character implosion and circumstantial humor that makes it a somewhat stressful viewing experience. The film is beautiful, the acting is wonderful, and the characters are deeply complex. It is the story that I found as slow as molasses. I believe that Footnote is worth one viewing, but after that I would rather spend my hours on something else. If you generally enjoy foreign films and don’t mind a slower pace, this is something that I would recommend for you. Otherwise, I would recommend viewing something else. Nominated for Best Adapted Screenplay (Beau Willimon, George Clooney, Grant Heslov). I was working in a movie theatre when Ides of March came out and I had a vague interest in seeing it. It probably had something to do with Ryan Gosling being in the film, but it was 2011, a year before elections, and I was sick of politics already. It is probably best that I avoided it, but now that I have some political clarity, I actually quite enjoyed the film and for what people my age tend to call “an old person film,” I really appreciated the 102 minute runtime. Governor Mike Morris (George Clooney) is gunning for the presidency and is deep in the trenches of political warfare–the democratic primary campaign. He claims no religion and always smoothly moves the questions in the direction of the constitution. His campaign manager is Paul Zara (Philip Seymour Hoffman), a man who has equally made his life about politics as well as loyalty among the ranks. The Ides of March has its main eye on another character–the right hand man to Zara is the young, dashing idealist Stephen Meyers (Ryan Gosling) who still retains his innocence toward politicians and the campaigning process. He claims the only reason he works for Morris is because he believes that he is the only solution to the country’s problems. It is as if he has Morris on a pedestal and the man can do no wrong. Things take a turn pretty quickly. The competition’s campaign manager, a Mr. Tom Duffy (Paul Giamatti), sees something brilliant in Stephen and asks him to meet him at a bar. It is here that he offers the young visionary a job and claims that he has caused another politician to jump ship with a promise of Secretary of State. Stephen is confused and reeling, not sure whether or not he should tell Zara about his meeting and not sure why Duffy would come to him with these stories. Stephen learns pretty quickly about the value of loyalty, but he also learns that no one is perfect. If you want to survive in this career path, you have to make the tough decisions and sometimes you might even have to compromise your beliefs for a man you once thought a saint. His innocence is shattered and he has to choose whether or not to let others trample all over him or to use the many weapons in his arsenal to get what he wants. Ides of March is a slow, dialogue driven, political thriller directed by George Clooney that uses its short run-time very effectively. Gosling’s character reminded me a lot of his character in Drive, although this time he is much more talkative. All of the actors did a good job–they were all believable in their roles and the people who you might love in the beginning prove to fool the audience just like they are fooling the American public. 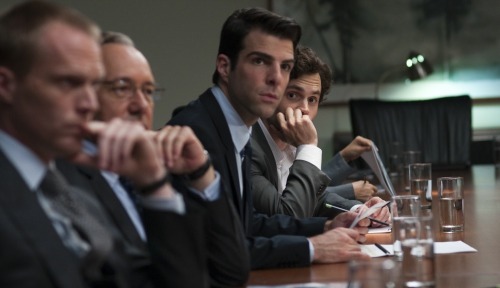 Politics can be a dirty game, and this film only shows a part of that. There is very little bias toward democrats or republicans, although there are shorts snippets of Morris discussing his liberal ideals. It isn’t a film to convince you to become democrat, but more of an insight into a world that we all know is full of liars and manipulation. They all want to get to the top, even the interns. If this sounds like your kind of movie, I would definitely recommend it. It’s not something I would watch all the time, but it is well made and the scripting, of course, is very well done.